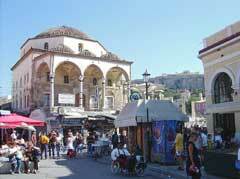 The Greek government on Tuesday unveiled a location for the first modern mosque in Athens. The mosque will be located in a downtown area of the city which is slated to be redeveloped as a sports and parks complex aimed at revitalising the city centre. The mosque will be built in the Botanikos area. The mosque will be paid for by the state, said Minister for Development George Souflias, adding it would be close to a new metro stop. Greece had pledged to build a mosque in Athens to serve the city's growing Muslim community, mostly immigrants from Asia, but the plan had stumbled over the choice of location. Earlier proposals included a site near the airport, 33 kms (20 miles) from the city, or the reopening of an 18th-century mosque which has since been turned into a museum. We welcome this decision and see it as a positive development in accord with the established position of the Church of Greece, Archbishop of Athens and All of Greece Christodoulos said in a statement.